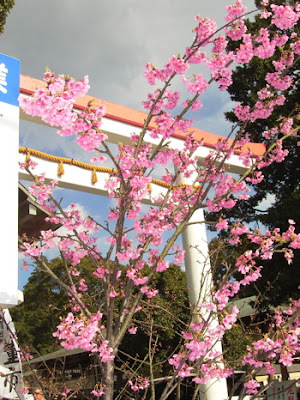 It is "Kawazuzakura" (Kawazu Cherry), which seems to come from Kawazu, down the road in Shizuoka (in fact it has its own kawazuzakura festival). The much more common Yoshino cherry are still a long way from flowering though. Meanwhile, this year sees the latest first snowfall in Tokyo since records began in 1876. Not that there's been any snow yet (and indeed no sign of it coming), but in 1960 the first snowfall was on the 10th Feb. There were actually a few flakes in some areas 3 weeks ago - including here, only 50km away from central Tokyo - but apparently not in the crucial place where they measure these things. Hi James, do you agree with Klaus' description of Japan? Yes, I think his comments about Japan are spot-on, although not especially original. The non-functioning cellphones is just a random standards difference rather than any sort of deliberate protectionism, I think. Columbus was not especially original either, especially after the Vikings. Around the edges it is still nice, and I'm sure you understand that the Japanese are very proud of their Protocol. Nice to hear that the protocol is only theirs, not ours. I would leave this pride to them, just like the Peace Memorial in Hiroshima designed by Czech architect Jan Letzel. "The topic of foreigner crime is taboo in Japan"